Discussion in 'Amps & Cabs Emporium Archive' started by architect, Apr 30, 2016. 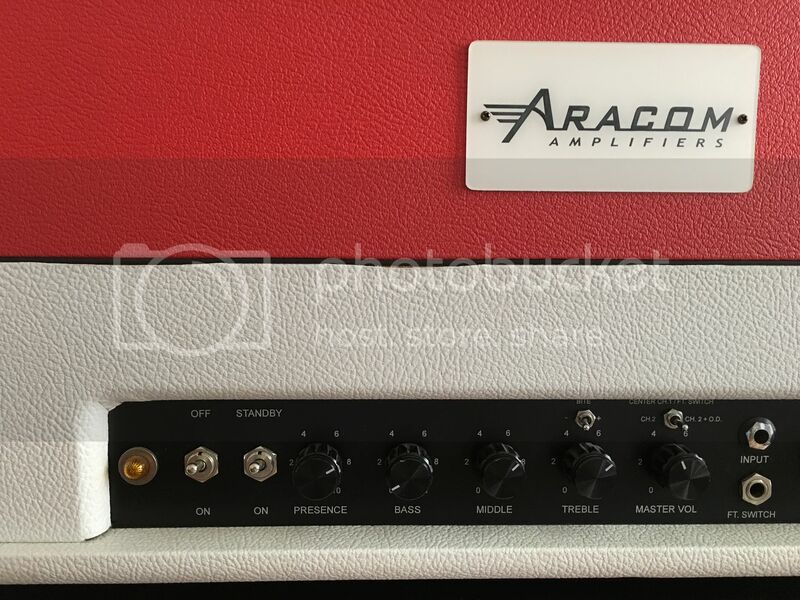 Up for grabs is a killer killer amp built by Aracom. Check out the videos from Gene Baker playing the same model. I have decided to stick with combos and down size my rig. 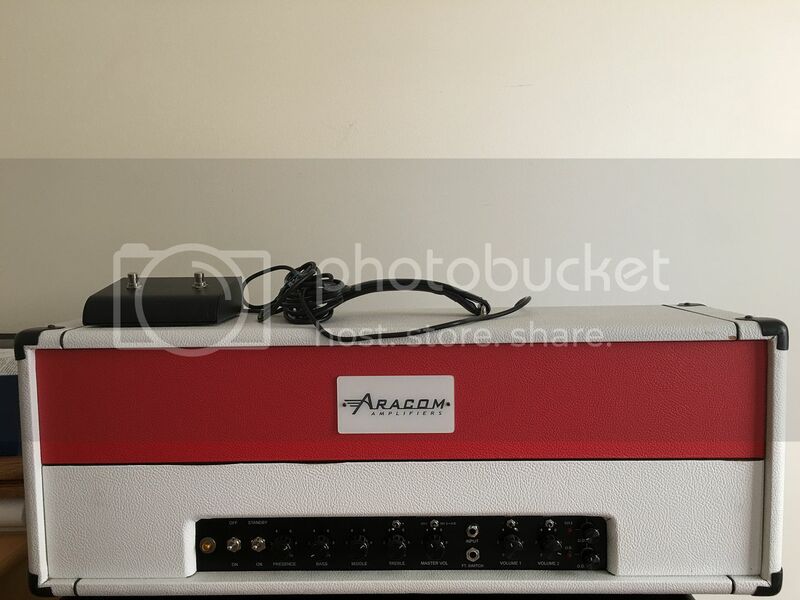 This amp was recently retubed and sounds amazing. Big bold KT66 cleans on the first channel. The second channel is like bridging the two inputs on a JTM45, it has a separate volume control and a bright switch to adjust the tone. The 2nd channel starts off where the clean left off. Very wide range of adjustment in levels of gain and volume. Can be setup for volume boost for soaring leads or just a slightly dirtier rhythm tone. The lead boost, that has separate gain, tone, and bright switch controls allows for even further tweaking. All the channels and lead boost are accessible from the footswitch or the front panel of the amp. Tones go from JTM45 to plexi to jcm800. This truly versatile head is all you would need as a gigging musician. The Evolver's channel switching design provides a Clean Channel with the Master Volume Control completely bypassed and a separate Lead Channel with the Master Volume Control simultaneously activated. The Clean Channel allows for maximum clean headroom and the Lead Channel with Master Volume Control activated, allows the overdriven volume to be set to an appropriate level. 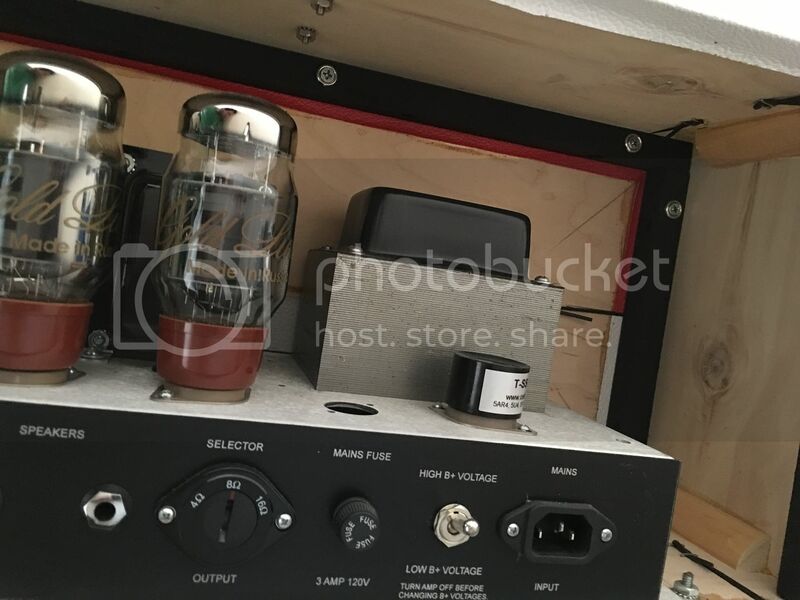 Plus the addition of the foot pedal activated - Tube Overdrive, allows for a highly versatile amplifier. Master Volume Control "bypassed", for maximum clean headroom. Master Volume Control "activated", allows for overdriven rhythm and lead tones. Channel 2 includes a Tube Overdrive effect that is activated via the remote footswitch. The Tube Overdrive can be used as a "lead" boost or be used to create a separate distorted rhythm tone. Separate Volume and Tone controls are provided for the Tube Overdrive effect. The Tube Overdrive provides a very "organic" distortion and not the typical "buzzy" distortion as found in some high gain amplifiers. The PPI-Master Volume design was chosen for its ability to maintain the overdriven tone, without the "buzzy" tone of other Master Volume configurations. While the "Global" Tone Control knobs adjust the overall tone, the Bright and Bright Cut switches allows you to "tweak" the final tone of each channel. Channel 1 - Bright Channel; "Bright" Cut Switch, for those who want to decrease the high end on this channel. Channel 2 - Darker, Lead Channel; "Bright" Switch, for those who want to "Brighten" up this channel. Activating this switch will also "tighten" up the low end. The global bite switch adds subtle gain to the "mids". Comes in handy when just a bit more gain is required. 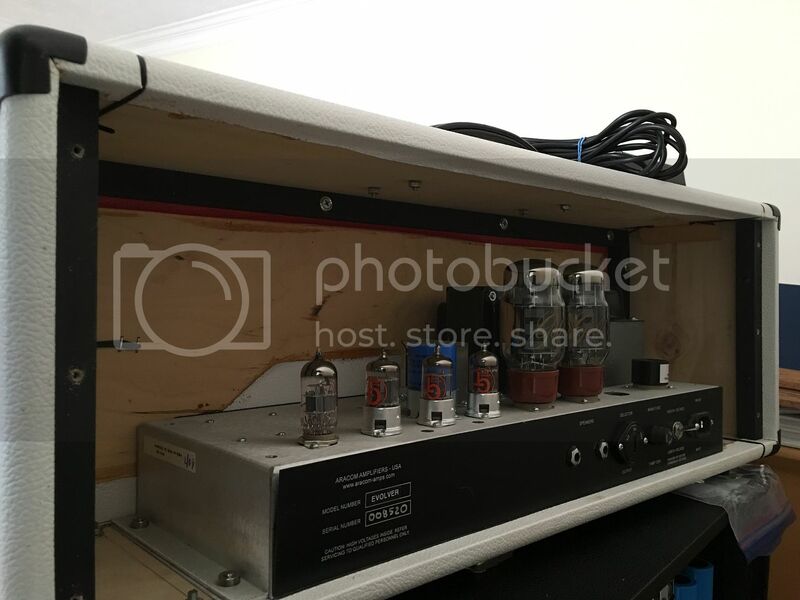 Lower powered 18-20 watt amplifiers are very popular, since you can crank them up while maintaining a lower overall volume level. 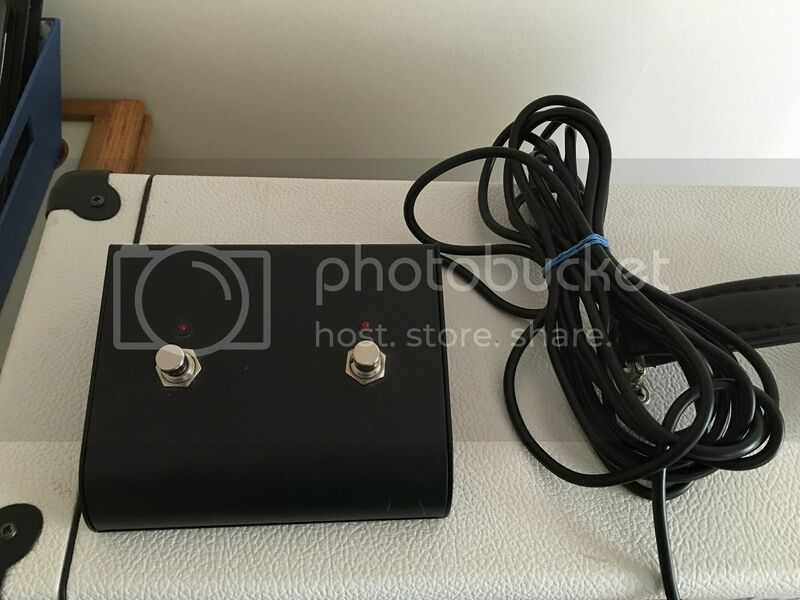 The Evolver is both a medium and low powered amplifier with the optional Hi/Low B+ voltage switch. This allows you to switch the amplifier from the maximum wattage to the half wattage mode, while maintaining the tonal qualities. The Hi/Low B+ voltage switch allows you to get the awesome "cranked up" tone at approximately half the wattage. Combining the use of the Hi/Low B+ voltage switch and the PPI-Master Volume allows you to control the cranked up tone from; bedroom levels to stage levels. Looking for $sold paypaled & shipped. 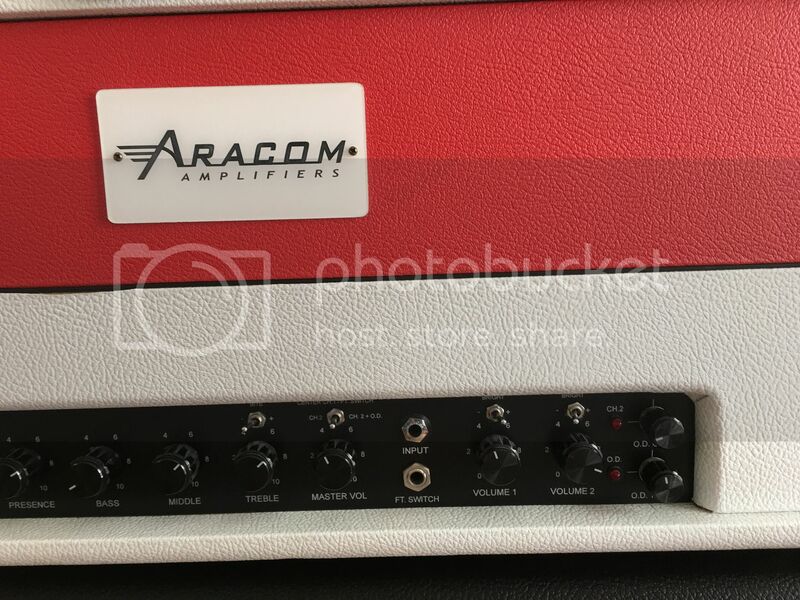 I dare you to find a better amp at this price. frankguitar, 57Strat777 and gkelm like this.